With few exceptions, the majority of streaming platform users tend to be largely in the under 35 set, but these services might do well to start courting an older demographic, with their deep pockets and streaming compatible tastes in music. With Troy Carter heading up Spotify’s Creator Services, the next land-grab for subscriber loyalty looks set to take place over album exclusives. This is great news for Millennials and Gen Z, who can expect a string of windowed albums to vie for their coveted attention. According to a 2015 study from Civic Science, 61% of Spotify’s listeners are 29 and under. There is no question that driving subscriptions, conversion and loyalty among young listeners is hugely important to the success of any streaming service. But there is also a huge older music loving demographic, and they shouldn’t be ignored. Given the billion dollars streaming services have collectively lost, it would seem practical to incentivize consumers whose deeper pockets might lead to subscriptions, rather than chasing listeners inclined to replace Top 40 radio with freemium tier services. There are ample opportunities to engage this audience, but the services are going to need to take a different tact. 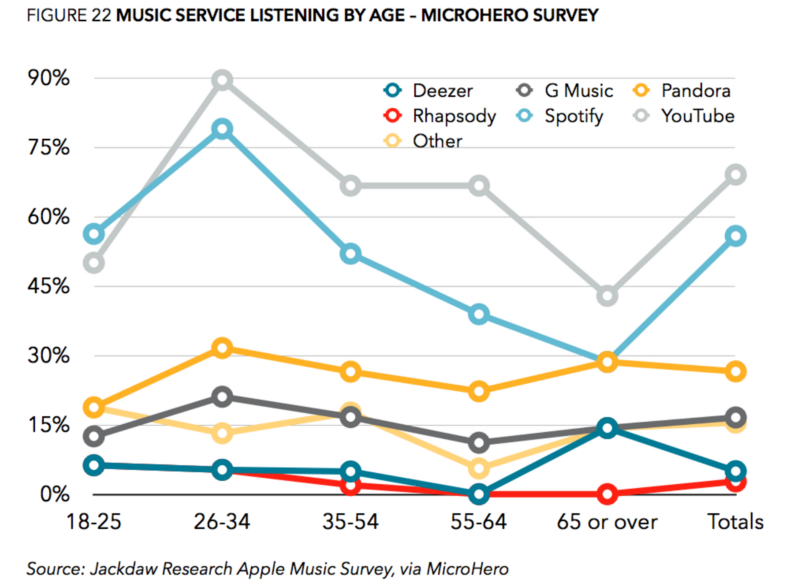 An October 2015 music survey by Jackdaw Research observed that aside from Pandora, most streaming service’s biggest listener demographic is under 35. This is unsurprising given that most people over 35 have had to purchase their favorite albums on at least 2 different formats, and likely own at least one apparatus that can still play them. 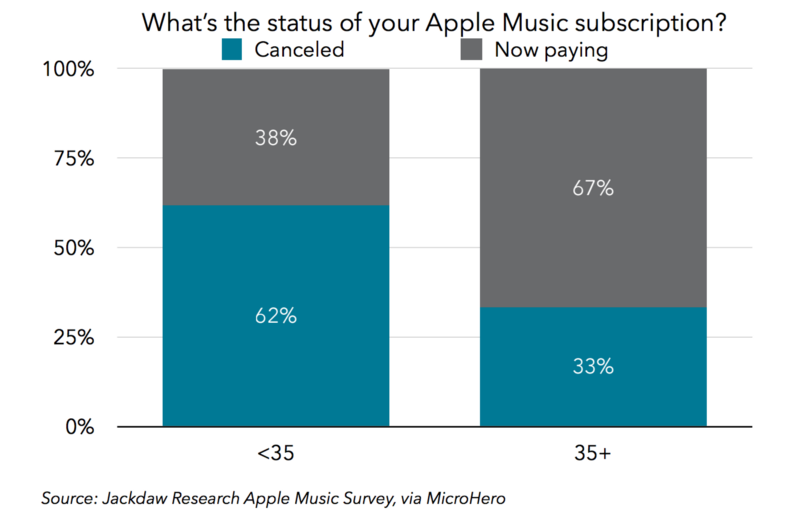 The same study also shows that users over 35 were far more likely to convert to paid subscriptions on Apple Music than their under-35 counterparts. Despite already owning tons of physical music, there’s an appetite for streaming music among older listeners, and they’re actually willing to pay for it. How do streaming services attract these listeners? Content matters, but not indiscriminately. In an apparent attempt to court the older crowd, last year the Beatles catalog was made available on all streaming platforms. Six months later, the top Beatles song on Spotify, Here Comes the Sun, sits at 27 million streams — a number that would be eye-popping for most bands, but likely fell short of label expectations. This might be the result of catalog fatigue — just over 5 years earlier, all 13 of the Beatles albums finally arrived on iTunes, which came 4 years after George and Giles Martin remixed the Beatles catalog for Cirque de Soleil in 2006. Six years before Love in 2000, all 27 of the Beatles’ no.1 singles were compiled on the album 1. This isn’t to say that evergreen catalog isn’t important. 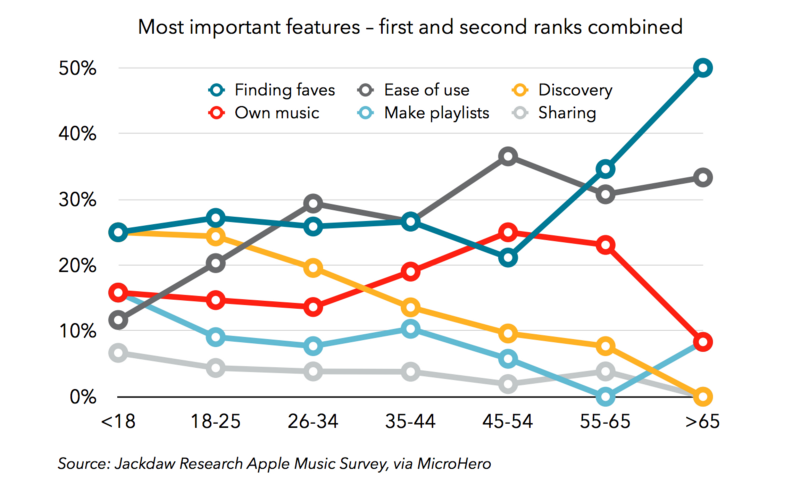 In the same study cited above, the ability to find favorites became increasingly important to older listeners on Apple Music, as music discovery became less important. In order to entice older listeners, streaming services will need to tap into new and unreleased material from catalog artists. Cult live bands like Phish and the Grateful Dead, whose fans had lively tape exchanges, could now be courted with plethoras of band-sanctioned bootlegs. Bob Dylan’s bootleg series has been successful in part because of its unique presentation of rare and live recordings. Labels could better exploit their catalogs by digging deeper into their archives, and streaming services can engage their older listeners by creating a unique experience for discovering familiar music. If this strategy were to gain any traction, we’d surely see Apple Music, Spotify and Tidal duking it out over the rights to Prince’s unreleased material (which they could conceivably be doing already). Thusfar, the fight for album exclusives has centered around new releases by major artists. While archival exclusives could certainly drive user loyalty, there are huge swathes of fandom surrounding new releases in genres like metal, country and EDM, and that translates into millions of people more excited about a new Amon Amarth album than a Drake one. Streaming services could leverage niche fanbases to drive loyalty outside of mainstream releases. While Apple Music, Spotify and Tidal are diving head-first into original video content to compete with Youtube and Snapchat, it’s significantly more challenging for them to woo older viewers, especially given linear TV budgets and the 5 billion dollars Netflix spent on content in 2016. That said, older listeners also spend more time reading articles online than their younger counterparts. By partnering with trusted names in music journalism and incorporating editorial into their offerings, streaming services could better engage their older audience with much greater cost efficiency. Last but not least, there’s radio. With Pandora’s 80 million active users, SiriusXM’s 30 million subscribers, the popularity of Beats 1 and the rise of Slacker and MixCloud, there’s still a huge appetite for programmed music, and that’s without factoring in the millions of listeners who still tune into terrestrial radio. Where on demand services are active listening experiences, radio is passive, and one that appeals to older listeners’ desire for ease of use and recognizable content. Fewer skips and longer listening times are markers of successful programming, and each streaming platform has a unique strategy to optimize its content for listeners. With Pandora and Amazon soon to launch on demand services and Spotify’s radio being far less utilized than their playlists, there is a potential for this service to get swept under the rug, but it shouldn’t be. Playlists are great, but they’re finite, and aren’t direct replacements for radio. Streaming services should endeavor to optimize their radio services for all of their listeners, young and old. The ability to insert local traffic, weather and news segments into digital radio would be a huge value proposition for subscribers who listen in their cars. And guess what? Most of those listeners aren’t Millennials. Between Guvera and Deezer’s failed IPOs and Spotify’s $200 million losses in 2015, it’s essential that streaming services start finding ways to become profitable. As Mark Mulligan showed in his recent post of Spotify’s gross margin per user, sheer volume of user acquisition isn’t necessarily enough to tip the scales. I’m not advocating that services cease trying to attract younger listeners. Millennials and GenZ will define the shape of the industry in 10 years time, and building streaming habits into their lives is incredibly important. But the streaming music industry needs money now, and there’s a whole world of adults with cash in hand.